Welcome to the Wazee Lake Recreation Area, Jackson County's newest and largest park. Wazee is the native HoChunk word for "tall pine". You are now viewing the remnants of the former Jackson County Iron Mine. The mine was in operation from 1967 to 1982. Before you lies the former mine pit where rock was removed, crushed and processed into iron rick taconite pellets. approximately [sic] 850,000 tons of taconite were shipped by rail annually to steel miles in East Chicago, Indiana. The mine was a model facility, using an environmentally safe practice of magnetic separation of the iron ore. While the mine was in operation, water was pumped from the pit at a rate of 8000 [sic] gallons per minute. when [sic] the pumps were removed in 1982, the pit began to fill with groundwater. The pit took over two years to fill to it's [sic] present level. The former pit has been named Wazee Lake, the focal point of the park. It is the deepest inland lake in Wisconsin, with depths exceeding 350 feet. The lake's water quality is considered excellent by environmental standards, and is hot to two-tier fishery consisting of smallmouth bass, rainbow and brown trout and bluegill. The first fish were legally introduced in late 1983 by the Wisconsin Department of natural [sic] Resources, and stocking continues on an annual basis. The lake is open to fishing, and special regulations apply. no [sic] gasoline powered [sic] boats motors are allowed to protect the pristine water quality. The lake has become the premier scuba diving site in Wisconsin due primarily to its excellent clarity, and attracts over 2,500 divers annually. The marker is located at the parking lot adjacent to the Fox Point Overlook at Wazee Lake Recreation Area. The entrance to the park is located at N6302 Brockway Road, Black River Falls, Wisconsin 54615. NOTE: Wazee Lake Recreation Area requires a fee to enter. 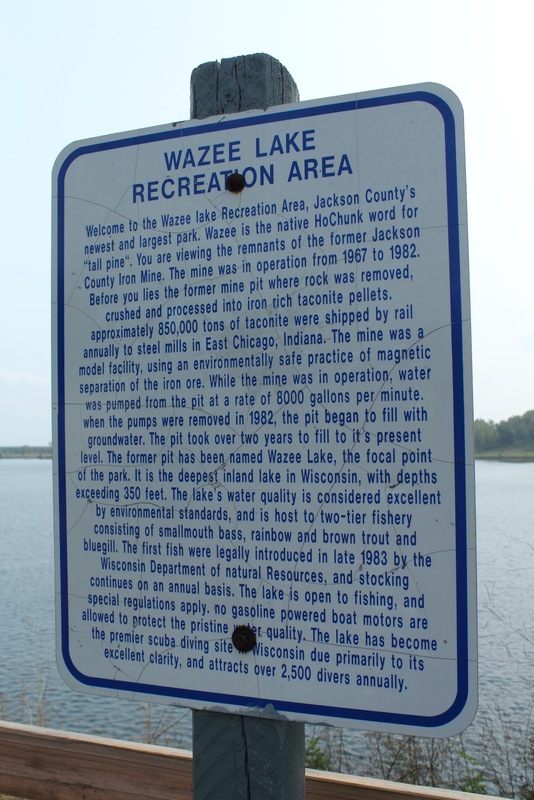 The lake is 146 acres in size and is the clearest and deepest inland lake in Wisconsin.Wazee Lake has become the most popular scuba diving site in the Midwest, attracting more than 1000 divers annually. "Wazee" means "tall pine" in the Ho-Chunk language. See also, Wazee Lake: Geology, also at this location. With Wazee Lake in the background. The marker is at the parking lot for Fox Point Scenic Overlook. Follow the signs to Scenic Overlooks. The fee entrance to Wazee Lake Recreation Area. The marker is located at Wazee Lake Recreation Area. in Black River Falls, Wisconsin.